Freedom Forum Institute > News & Commentary > Inside the First Amendment > Are high schools teaching students to devalue free speech? It seems like every few months we’re treated to the results of a new survey that has something dismaying to report about how young people approach free speech. 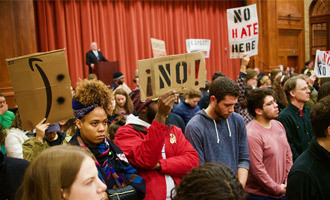 Last fall, the Brookings Institute reported that college students have a number of misconceptions about how the First Amendment works — a significant percentage believes that it doesn’t protect hate speech, and that it requires that an offensive speaker at a public university be matched with another speaker with an opposing view. Last week, a survey conducted by Gallup and the Knight Foundation found that 37 percent of college students think that shouting down an offensive campus speaker is acceptable; even more troubling, another 10 percent said that violence is also an acceptable tactic for silencing an offensive speaker. Findings like these always lead to a lot of hand-wringing about the intolerance of today’s youth, followed by a backlash of editorials pointing out that campus protests — especially at elite colleges — are over-covered by the news media, usually topped off by internet commentators decrying liberal snowflakes and at least one columnist reminiscing about the ’60s at Berkeley. I enjoy that as much as the next person, but let’s skip it for today. Why do college students have a shaky understanding of the First Amendment and an aversion to opposing or controversial views? This entry was posted in Inside the First Amendment, News and tagged Inside the First Amendment, student expression, student protest, student speech by Lata Nott. Bookmark the permalink. I look at free speech from the point of view not of the unpopular speaker, but the point of the audience for unpopular views. I want to know if someone wants to say that I am hateful. The Constitution protects the right to HEAR whatever our neighbors wish to say, not the neighbors’ personal right to be heard. We call this protection freedom of speech because it is easier to censor the speaker than ban the audience. Still, journalists often defend the people’s “right to know,” not the journalists’ right to speak. This distinction matters in the context of high-school speech. Three year-olds vent all the time, but not about things the constitution cares about. At what age of speaker does my right to hear that speaker attach? By what test do the mewlings of a baby become the constitutionally protected wisdom of a child? Dare I suggest the first trimester of high school?